The trends look good for healthcare real estate -- is this the way to play it? Photo: Scott Jacob, Mesa Royale Apartments. I've written several times about the merits of healthcare real estate as a long-term investment, and senior housing properties are one of my favorite types. So Senior Housing Properties Trust (NASDAQ:SNH) would seem like a logical choice. However, just because I like the industry doesn't make Senior Housing Properties Trust a great company. Let's take a closer look at this healthcare REIT and see how it stacks up against my favorite healthcare REIT, sector heavyweight Welltower (NYSE:WELL). How does Senior Housing Properties Trust make its money? As a real estate investment trust, or REIT, Senior Housing Properties Trust has as its main business acquiring properties and leasing them to tenants. And as the name implies, this REIT's properties are mainly related to senior housing and related healthcare operations. Currently, the company owns 428 properties -- 55% of which are some variety of senior housing (assisted living, independent living, or skilled nursing facilities), and 42% are medical office buildings. Source: Senior Housing Properties Trust. Most of the properties are private-pay, which created limited exposure to government reimbursement -- which creates a big question mark for the future of many peers. And the company is well diversified, both geographically and among its 640 tenants. Finally, Senior Housing Properties partners with some of the best operators in the business to run their facilities, including Five Star Senior Living, Brookdale Senior Living, and Sunrise Senior Living. Why invest in senior housing? Basically, there are two main compelling reasons to invest in senior housing, and healthcare in general. First, the market is highly fragmented. The healthcare real estate market is estimated to be about $1 trillion in size, and even the largest REITs have less than a 3% market share. So there is tremendous opportunity for consolidation ahead. Second, and most importantly, the demographics indicate that the future will hold a lot of demand for senior housing properties. The U.S. population is aging rapidly, and with millions of baby boomers getting ready to retire, there will be a tremendous need for senior housing. In fact, during the 20-year period from 2010 to 2030, the 65-plus population is expected to grow by 78%. This is one area where Senior Housing Properties Trust looks a little riskier than its peers. Less than half (49%) of the company's capitalization consists of equity, while the other 51% is debt. And, about one-fifth of the debt is mortgage-based, meaning that the loans are secured by the underlying properties. Both of these metrics are significantly higher than those of major competitors. The result of this level of debt is an interest coverage ratio of 3.5. In other words, Senior Housing Properties Trust earns $3.50 for every dollar in interest it needs to pay. This may sound pretty good -- and it indeed provides the company with a nice cushion before it would become unprofitable, but it significantly lags behind some of the industry's heavyweights. For comparison, Welltower's debt makes up just under 40% of its capitalization, resulting in a much more comfortable interest coverage of 4.3, and the company has committed to maintaining a 60/40 equity/debt ratio on all new capital raised since 2010. As far as dividends go, Senior Housing Properties Trust pays a $1.56 annual dividend, which translates into an impressive 8.9% yield as of this writing. Even more impressive is that it appears to be sustainable, at 85% of the company's normalized funds from operations (FFO) -- on the higher end, but pretty normal for a REIT. For comparison, Welltower pays out 73% of its FFO, but it produces a lower 5.1% dividend yield. However, the dividend history isn't quite so impressive. Sure, the company has a decent history of increases, but there are two things to point out from the following chart. Most obviously, notice that there haven't been any increases for the past three years. I've written before that a stock's ability to sustainably increase its dividend every year is a big factor in my decision to invest. Simply put, a stagnant dividend looks great now, but it won't look as great in a few years as inflation erodes its purchasing power. Additionally, note that the dividend has only grown by an average of 1.8% per year since 2002 -- not the type of long-term growth rate we want to see. For comparison's sake, the aforementioned Welltower has increased its dividend at an average rate of 5.7% over its 45-year history. Now, I'm not saying this record makes Senior Housing Properties Trust a bad dividend stock by any means, just that it lags behind peers in certain key metrics. As far as performance is concerned, the stock has produced an average total return of 11% per year for its investors over the past 15 years -- not too bad at all. 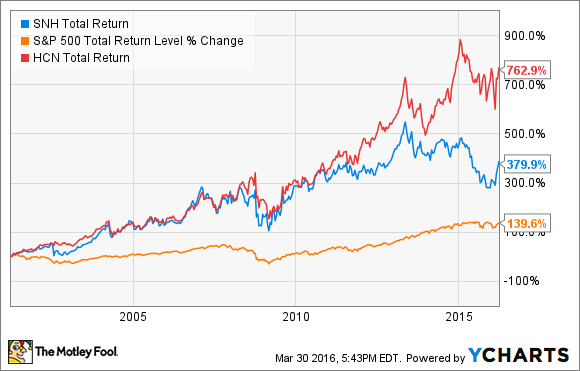 This handily beats the S&P over the same time period, but it does fall short of Welltower's performance. In fairness, past performance doesn't necessarily predict future results -- but it can be a pretty good indicator. I mentioned funds from operations (FFO) a little while ago. This should be thought of as the "earnings" of the REIT world, as it is the best representation of how much money these companies are actually making. Having said that, let's take a look at how Senior Housing Properties Trust stacks up to some of its peers. Senior Housing Properties Trust certain trades at the low end of the valuation spectrum, which can help to make up for the higher-than-peers debt load and the added risk that comes with it. On paper, there are several reasons why one might want to go with one of the healthcare REIT giants such as Welltower -- lower debt, stronger track record of performance, and so on. However, Senior Housing Property Trust is a solid and stable company with a dividend yield of nearly 9%, which is rare. Additionally, while its performance history may not be quite up to the level of its peers, a 11% average total return sustained over a 15-year period is still pretty impressive. And, the fact that a stock with such a metric trades for just 9.5 times earnings make it look pretty cheap to me. As long as you're aware of the extra risk going in (like the higher debt load I discussed), Senior Housing Properties Trust could be a strong income stock for your portfolio for years to come.